I wanted to introduce a few of the makers briefly here for the website launch and over the next few months I’ll be doing a series of more in-depth “Meet The Maker” blogs to share more of each of their stories and to help you get to know you the people behind the products. Charlie Brandon-King is another great friend and one of the first people I met when I moved to Bristol 4 years ago, at the same time that she had also just moved here. We met at a Laura Veirs gig in the Rise Records store and bonded over a love of cake and folk music. She is an extremely talented illustrator and created a cafe menu for our music studio and artwork that inspired our studio logo as well as striking letterpress lyrics prints for each studio room and my These Two Hands logo. 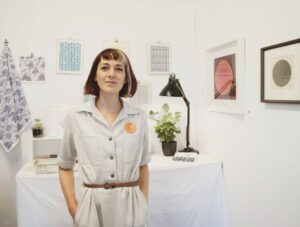 When she’s not busy illustrating childrens’ books, she likes playing with different materials and techniques, and combining nature-inspired ideas with geometric prints. She created the leaf print ceramic coasters exclusively for the These Two Hands website and there will be a range of fabric products coming later in the year. You can see more of her work on her website. I discovered Wendy Calder at a tiny street fair in Brislington and loved her botanical ceramics so I took her card and got in touch as soon as I decided to go ahead with These Two Hands. I also signed myself up for a pottery course with her as she lives just around the corner from me and I couldn’t think of a nicer way to spend a few weekday mornings! I want to fill my home with everything she makes and she is such a lovely person to work with! 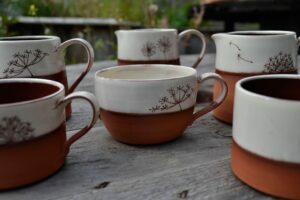 My favourite way to start the day is drinking strong coffee out of my dandelion scraffito coffee cups! My skin will be forever grateful that I came across Julie at Wild Sage & Co and her lovely natural beauty products at the BS5 local market earlier this year. I have rosacea and I struggle to find any natural moisturisers that agree with my skin and don’t cost a fortune, but Julie’s Argan Face Balm is like a huge hug in a jar – it makes my face feel amazing and smells amazing and it lasts for ages too! I want everyone to try it as it really is a magical thing! Her Frankincense & Shea Body Balm melts in to your skin and I’m hoping to expand the range on These Two Hands over time to include some of her lovely bath oils too. Julie grows lavender, marigolds, chamomile, rosemary and many other herbs next to her veg patch and everything is dried, chopped and infused in her old converted barn workshop in Herefordshire. 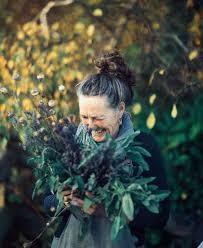 She started experimenting with natural cleaning products many years ago and in 2013 Wild Sage & Co was born. The range started with a few hand soaps and now includes balms, body scrubs, bath oils and much much more. 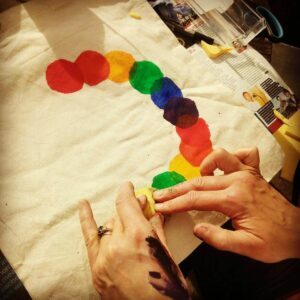 This first blog is turning into a bit of an essay so I will save the stories of the rest of the makers for later blogs. 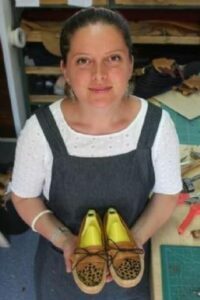 Please email me or comment on here to let me know what you think of the collection or if you’re a nature-inspired maker, please get in touch if you would like to be part of the These Two Hands community. Thank you for supporting locally handcrafted products and independent makers and for caring about how things are made and who makes them. Each of you makes my world a much better place!